Most people visit Paignton Zoo to see rare and unusual animals - species they may never have seen before from exotic habitats around the world. 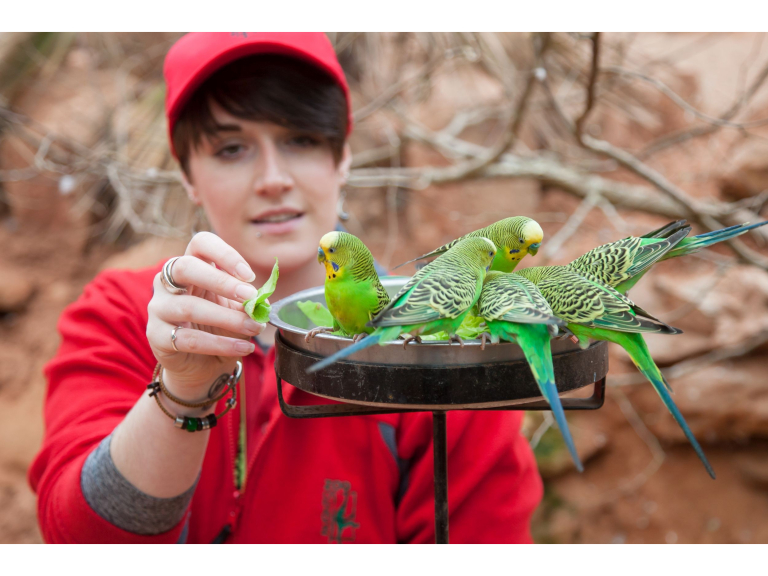 So it comes as a surprise to discover that the star of Paignton Zoo’s new guest encounter is also the world’s most popular pet bird – the budgie. “Budgies in the wild live in huge flocks in the Australian bush, often tens of thousands of birds together. It’s a tough life, they have to be migratory and fly huge distances to find food. It’s this behaviour that gave them their name – if you follow wild budgies, they’ll lead you to food, hence ‘good eating’. Zoo staff want guests to reconnect with nature – to stop and look rather than glance and move on. Steve again: “The budgies are just one of the species in our amazing Desert House - if you spend a few moments you’ll quickly realise that there’s a soap opera of life going on around you. Birds lead busy and fascinating lives and you’ll soon see that they’re not just flying around randomly. “The great thing about bird watching is that you can do it anywhere - on a lunch break, in the playground, at home in your garden, or of course at Paignton Zoo. We say anywhere but actually there are places where it’s harder than it used to be to watch birds because the birds aren’t there anymore. Here at the Zoo we’re supporting a Europe-wide conservation project called Silent Forest which aims to conserve endangered song birds in Asia threatened by collection from the wild for the pet trade. Paignton Zoo’s Aridland Encounter talk is in the Desert House every day at 12.30 during the Easter holidays. Paignton Zoo Environmental Park is a registered charity. For more information go to www.paigntonzoo.org.uk or ring 01803 697500.